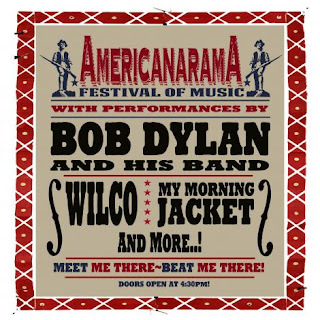 Is it just me, or has the Bob Dylan + Wilco + My Morning Jacket summer concert tour, aka Americanarama, not gotten nearly the attention it deserves? I think it's because Bob Dylan is on the top of the bill. Don't get me wrong: Bob Dylan is a genius. In the 1960s, his music and lyrics were innovative and revolutionary. Amazingly, he's managed to remain culturally relevant for nearly 50 years. That being said, Dylan isn't what he used to be. Honestly, I don't know how good the Bob Dylan live experience was before 1995, but I've seen him several times in the last 18 years and every show has left me wondering, "Why doesn't Bob Dylan want to entertain his fans?" The Toronto chapter of the cult of Wilco was sufficiently numbered to fill the 2,750-seat Massey Hall for a couple of nights on the band’s tour behind The Whole Love in September of 2011, after all, and My Morning Jacket’s local following by now easily tests the bounds of a 2,000-plus venue such as Kool Haus. Oh well, I can't say I'm surprised. Nevertheless, I'm excited about seeing Wilco, My Morning Jacket and Richard Thompson at Shoreline Amphitheatre this Sunday. Should be fun. But I can't guarantee that I'll stick around for all of Bob's set.